Those factory wheels have just got to go! 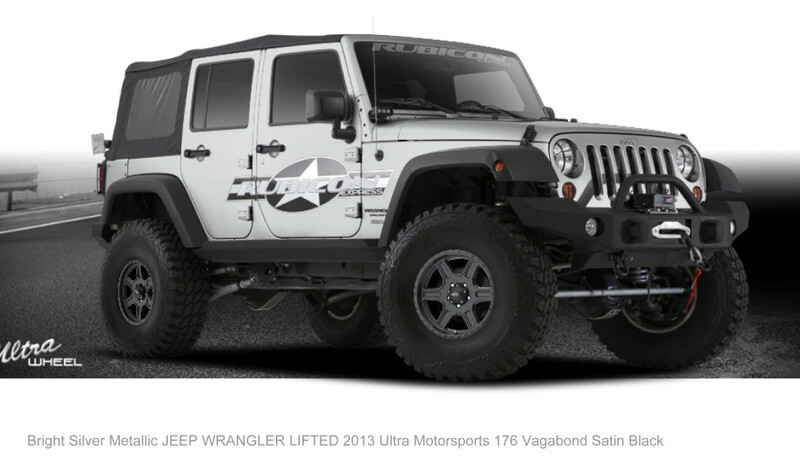 A new set of wheels along with the addition of offroad tires is the first change most people make to their stock Wrangler. To make the best choice in wheels, you must have a good understanding of wheel offset and backspacing. Wheel Offset is the distance between the hub mounting surface and the wheel’s center line. 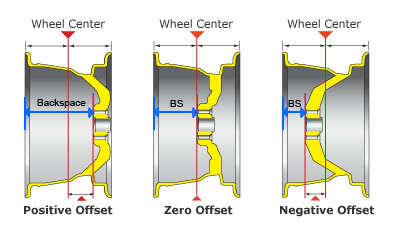 As you can see from the drawing below, a wheel will have a positive offset if the hub mounting surface is to the outside of the wheel’s center line. A wheel will have a negative offset if the hub mounting surface is to the inside of the wheel’s center line. A wheel will have a zero offset if the hub mounting surface is right on the wheel’s center line. Wheel Backspacing is the distance from the hub mounting surface to the back edge of the wheel. The smaller the backspacing, the farther the wheel will stick out from under the the vehicle. 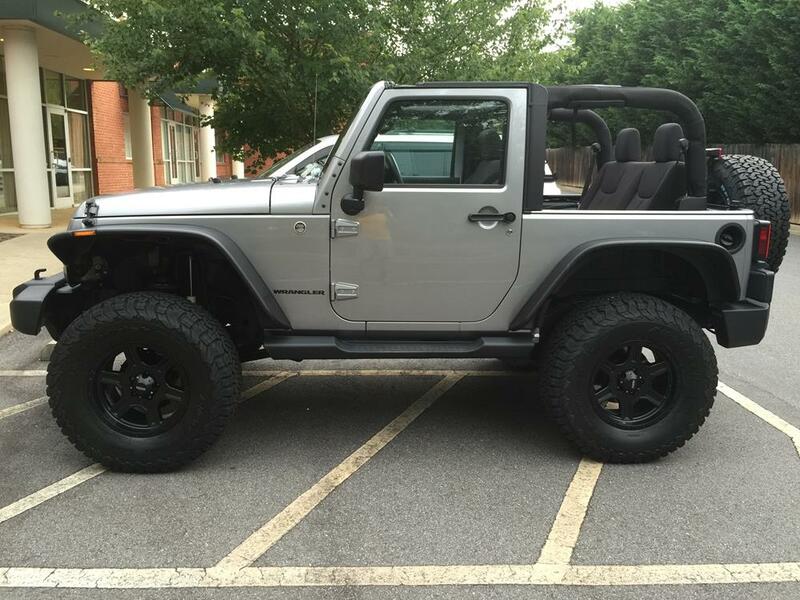 If you want a wide stance for your Jeep Wrangler (tires sticking out from under the vehicle), you will want wheels with a small backspace and a negative offset. If you want the outside of the wheels flush with the fender flares, you will want wheels with a larger backspace and a positive offset. The chart below shows the offset (in mm) for a given backspace and wheel width (in inches). Nothing like mixing metric and english measurements together – huh? The bottom line is that on a lifted Jeep, you want to make sure that you have enough backspacing to keep your full turning capabilities without the tires rubbing. I decided to look for a 9″ wheel width with a 4.5″ – 5″ backspacing. My stock wheels were 17″ in diameter and I could have replaced them with 18″ or even 20″ diameter wheels, but I preferred the wider tire sidewall look of the 17″ wheels. We were thrilled to gain a sponsorship from Ultra Wheels of Fullerton, CA. 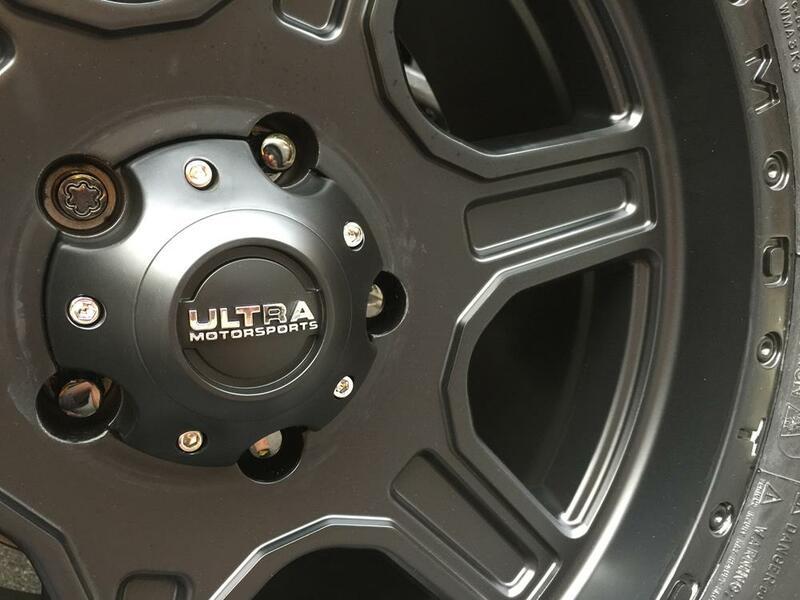 Ultra makes the Focal, Platinum, Worx, Walker Evans and Ultra Motorsports branded wheels. It was tough to make a final selection because they have so many unique offerings. 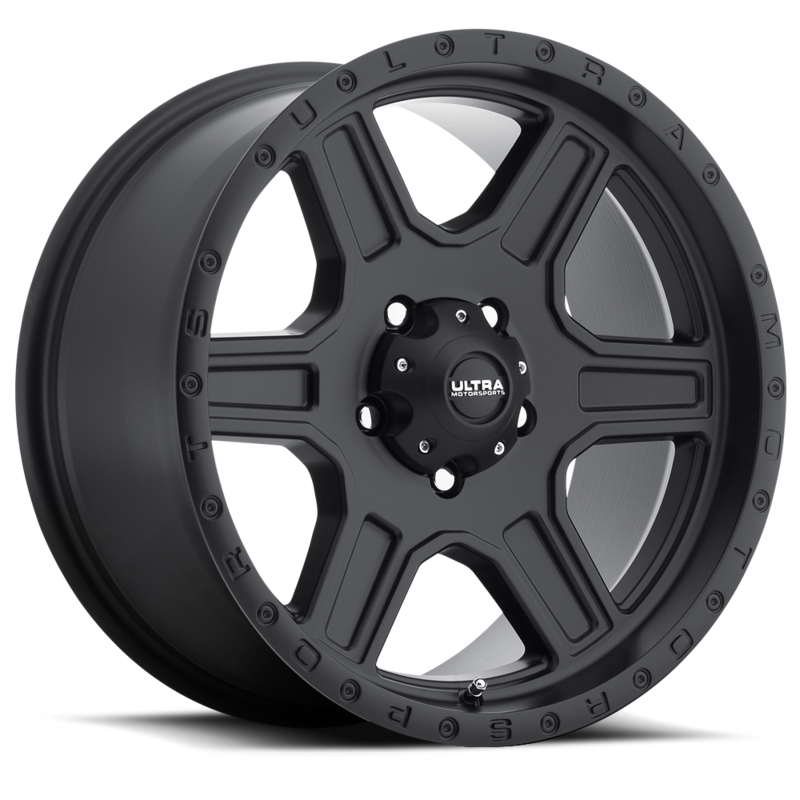 We eventually went for an all black/satin finish look with the Vagabond, model 176-7973SB+01, with 5 lugs to fit the Wrangler. It has a 9″ width, a 1mm offset and a 5″ backspace. The lettering cut into the rim of the wheel was the clincher. Ultra makes this same model in a gloss black with a diamond cut lip. Also fantastic – a tough choice. 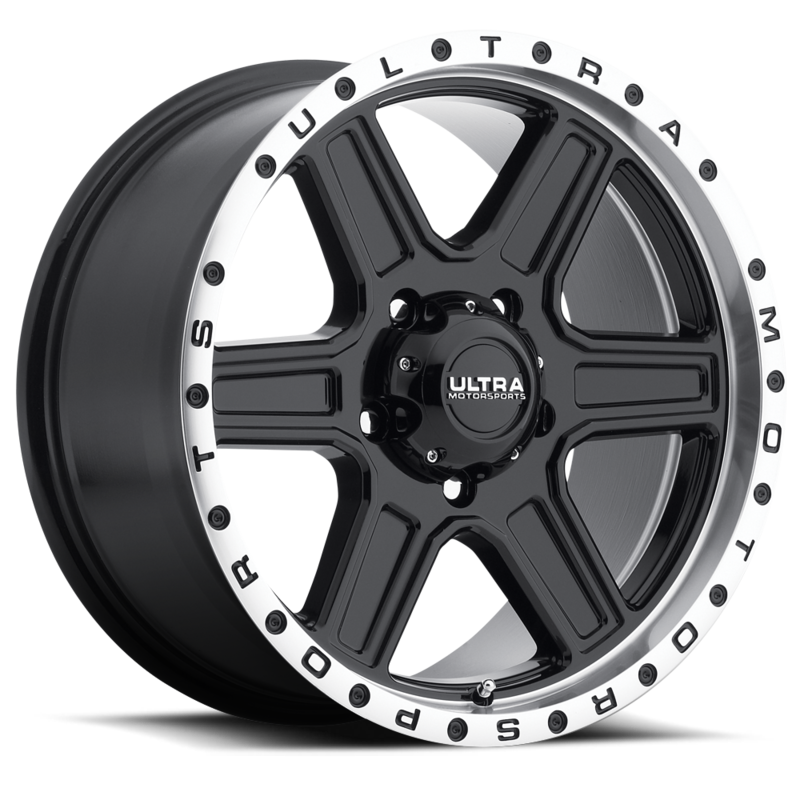 If you are having trouble picturing how a given wheel will look on your rig, Ultra has a wheel configurator that is extremely helpful. It lets you choose a wheel size and lift height before showing your chosen wheel model on a representation of your model year’s Wrangler (even with a few color choices available). What a great help to the selection process. I think the real thing is better though.